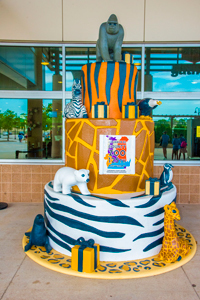 Our giant birthday cake features iconic animals like Samson the gorilla and Slick the sea lion. Photo Opportunity: The party starts with a photo opportunity in front of our giant (11-foot!) commemorative cake in the front entrance mall. Snap a photo to treasure throughout the years. Animal Treats: The party isn’t just for the humans, select animals will receive birthday cookies as part of their enrichment for the day. Stop by and see the siamangs celebrate at 1:30 p.m., the small mammals at 2:30 p.m. and the prairie dogs at 4 p.m.
Live Music: A requirement for any good party is music, and the Zoo is ready to boogie! Kip’s Fun Show is an interactive presentation using electronic magic where visitors help create the music with their voices, hands and entire bodies. Be ready to perform with trick instruments and animated critters. For the Kids: Kids can join in a creative coloring activity! On our giant banner, help us color in all of the animals found in the woods around the Zoo. Don’t forget to check out the different tracks (or footprints) the animals leave behind in the forest. Color in style with your very own tiger, elephant or elk headband. Blast from the Past: We have a lot of history here at the Zoo, come learn about some of the highlights, including a Samson the gorilla artifact display located near his former exhibit in Primates of the World. In 1919, we garnered worldwide fame with the first surviving polar bear born in captivity. Take time today to learn about polar bear adaptations. Choo Choo: Our Safari Train is a highlight for many visitors during their trips to the Zoo. Learn about the history of the train, pick up a train tattoo to show off and be an engineer for the day and pose for a picture. Historical Timeline: Interested in learning more about the Zoo’s history? Journey from the Zoo’s beginning in 1892 to present day with this special timeline, displaying stories and important events spanning 125 years. Visitors receive a reusable grocery bag if they’re one of the first 125 families to make a pledge not to use plastic bags. Protect Future Animals: Help protect elephants and other animals in the next 125 years by signing an ivory petition to support a law banning the sale of ivory and rhinoceros horn in the state of Wisconsin. Visit our oldest animal at the Zoo, Onassis the Amazon river turtle, and pledge to help all sea creatures by avoiding plastic bags. The first 125 families to make the pledge will receive a reusable grocery bag. Commemorative Keepsakes: While touring the special areas mentioned, be sure to get your Zoo Bookmark to take home as a special anniversary souvenir. The Prize Patrol may choose YOU to win a special giveaway! Prize Patrol: We continue with 125 days of fun -- at 1:25 p.m., a lucky visitor will be chosen by our “Prize Patrol” to receive exciting giveaways, such as free tickets for the North Shore Bank Safari Train, Oceans of Fun Seal & Sea Lion Show, free concessions items or even Zoo merchandise from our Karibu Gift Shop! The Zoo will be open from 9 a.m. to 5 p.m. with special events taking place from 9 a.m. to 1 p.m. Regular admission and parking rates apply. For more information, call the Zoo at 414.256.5466.